Sensei Stician Samples is a talent with exceptional communications and facilitation skills. 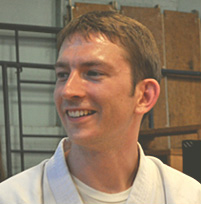 Sensei Samples currently holds the rank of 4th Dan, 4th degree black belt in Okinawan Tomari-Te Shorin Ryu. A natural and gifted teacher, he is currently teaching classes in martial arts to students ranging in age from five years old to adulthood. One of his areas of specialty has been crisis counseling and work with youth at risk. He is increasingly focusing on curriculum design and organizational development. He received his Bachelor of Arts degree in the Psychology of Communication from The Evergreen State College in Olympia, Washington. He received his Masters of Arts in Intercultural Service, Leadership and Management at the School for International Training in Brattleboro, Vermont. A world traveler from a young age, he has helped to facilitate and support service-based educational programs in India, Thailand, and Nepal, and has also traveled to Japan, Australia, Canada, Mexico, and the former Soviet Union. From time to time he co-presents with Cheryl Charles on topics related to conflict transformation; mind, body, spirit; and the environment.